Petsalakis and Rebek have explored the fluorescence of stilbene inside a couple of different kinds of capsules. trans-Stilbene exhibits weak fluorescence in solution, but when placed inside a small capsule, the fluorescence disappears almost entirely, while in a large capsule, the fluorescence returns to normal. They examined stilbene inside two different capsules using a variety of DFT and ONIOM techniques. Figure 1. CAM-B3LYP/6-31G(d,p) optimized structures of (a) trans-stilbene, (b) cis-stilbene , (c) the 1.1 capsule, and (d) trans-stilbene inside the 1.1 capsule. 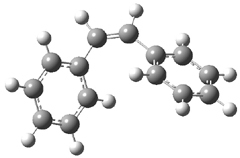 The structure of trans- stilbene inside the 1.1 capsule is shown in Figure 1. Of particular note is that the stilbene is no longer planar. (This twisting is perhaps better observed by an end-on view, which the reader can obtain by clicking on the picture and then manipulating the full 3-D structure using the Jmol applet.) 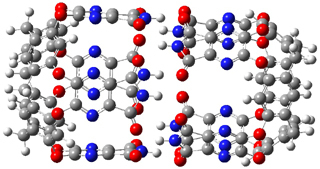 The different computational methods give slightly different encapsulated structures, and vary a bit in their binding energies, but the twisting of the stilbene is reproduced by each method. 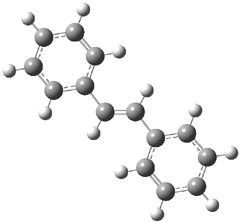 Though not shown here, trans-stilbene in the larger capsule is again a nearly planar structure. The structure of the S1 state of trans-stilbene in the large capsule is the same as for free trans-stilbene. However, the geometry of the S1 state in the smaller 1.1 capsule is twisted and corresponds to the conical intersection geometry. The absorption spectra and the emission spectra were computed for the free and encapsulated structures. The absorption and emission spectra for free stilbene and stilbene in the larger capsule are nearly identical, corresponding to the experimental observation of similar fluorescence behavior. 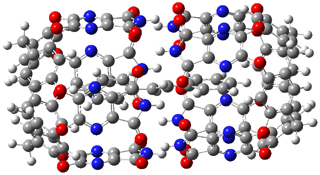 The absorption spectra of stilbene in the 1.1 capsule has a small blue shift of 8 nm due to the twisted geometry. But the major result is that the S1 state of stilbene inside the 1.1 capsule distorts to the conical intersection, allowing for radiationless return to the ground state. This means that there would be no fluorescence, and that is exactly what is observed.